When the dog days of summer arrive, you will find yourself moving from shady spot to shady spot in your yard. Shade gardens are a true blessing in the summertime. The photo above is from an enchanting private garden that I visited in England- Kiftsgate. While the rest of the tour group was having tea and scones in the kitchen, I continued to explore the gardens and take more pictures. You may not have a thatched roof cottage in the distance, but you CAN create a beautiful shade garden like this one right here in Connecticut. 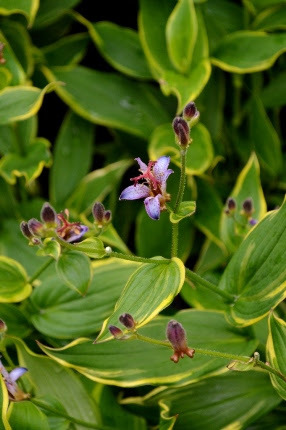 One of the best perennials for the shade garden that is just beginning to bud up is Tricyrtis or toad lily. The flowers clothe the arching stems and resemble little orchids. We have a couple of stands of toad lilies in our demonstration gardens, including a large drift under the ash tree by the road, right next to pink turtlehead (Chelone lyonii). Another of my favorite shade plants are late blooming Astilbes and Cimicifugas. Both have frilly foliage and dramatic flower spikes. I saw many fine examples in England, used, of course, in great masses. Here at Natureworks, we have Astilbe ‘Purple Candles’ in our shade garden across from our front porch just about to come into bloom. In our garden by the road, we have a stand of Cimicifuga ramosa ‘Atropurpurea’ that has lived there for over 20 years! I has exceptionally fragrant, white flowers in late September and October and burgundy tinged leaves. 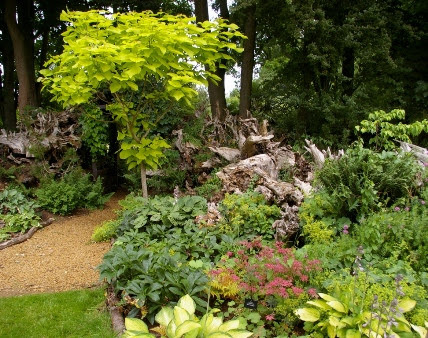 Here’s a novel idea for a shade garden: a STUMPERY! I actually visited TWO stumperies in England. When stumps are removed from an area (usually to create a new garden or outbuilding), they are saved and then artistically arranged. Soil is added and they are planted. How cool is that?